Dazzler Laser. Photo: Courtesy US Army Natick Solider Systems. Anyone familiar with the various TV Shows and Movies in the “Star Trek” franchise, is well familiar with that phrase and that fictional hand-weapon’s ability to be switched from lethal to non-lethal mode. With the increased emphasis on the Global War on Terror, irregular, and asymmetrical or urban warfare, today’s real-world warfighters are relying more and more on non-lethal weapon systems. Growing research in this arena is increasingly on the development of weapons that attack the various senses to incapacitate, but not necessarily kill, an opponent. Here is a rundown of some that are still “sci-fi” and others that are very real, and in, or close to deployment. 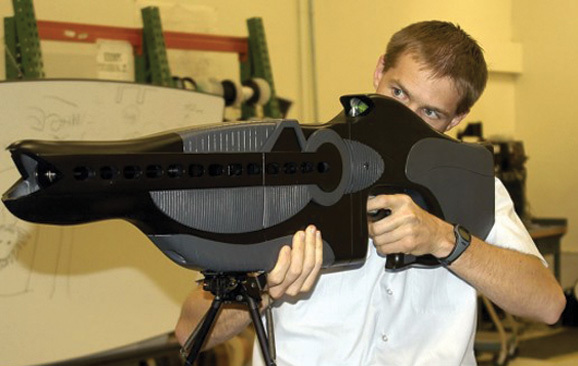 The Psychotronic Gun – Even the name sounds like something straight out of a bad B-movie, but the Russians allegedly have under development a weapon that employs electromagnetic radiation to directly affect the central nervous system in several nasty and unsavory ways. Long Range Acoustic Device – Unlike the above, which is still, if anything, in the theoretical, and very early stages of development, the US Army and Navy have actually deployed a weapon known as the Long Range Acoustic Device (LRAD) that uses targeted sound waves to “inflict pain and severe discomfort” on its victims. Better Bang for The Buck – Flashbang or stun grenades have long been used by Special Forces and other troops to clear an area of hostiles. However, “first generation” flashbangs have often been criticized for the damage they can cause to property by fire and concussion. Newer flashbangs have recently been in development by Sandia Labs that purport to deliver all of the stun factor without the property damage. Instead of a conventional explosive, it emits a plume of aluminum powder which ignites burning incredibly bright but for only a few milliseconds. Dazer Laser and/or Dazzler Devices – Laser Beam weapons have been a staple of Science Fiction since the days of Flash Gordon. There are currently in use and in development several devices that use light as a weapon, not to burn through anything, but to temporarily blind an adversary with incredibly bright beams of light to stunning effect. 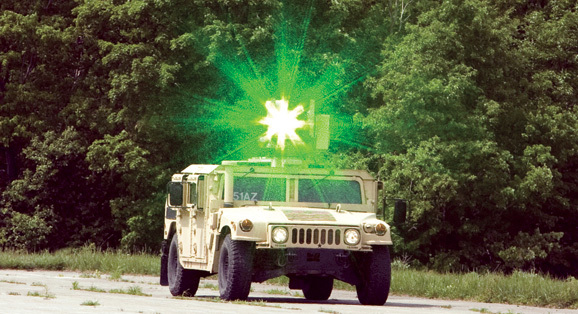 Pulsed Energy Projectiles – The US Military has been actively pursuing the development of Pulsed Energy Projectiles, or PEPs. A PEP fires a laser pulse that is very intense, but only a fraction of a second in duration. The tiny pulse creates a plasma burst that is strong enough to knock a 300 pound man to the ground. PEPs are generally being developed as crowd control and disbursement devices. Dazzler Mounted. Photo: courtesy PEO Solider.